“I truly believe compassion provides the basis of human survival, the real value of life, without that there is a basic piece missing. We essay writing services cannot be happy ourselves without thinking about the happiness of others.” ~ His Holiness, The 14th Dalai Lama. 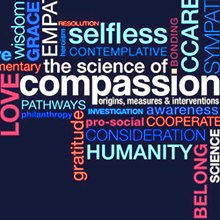 I just returned from The San Francisco Bay area where I attended the inaugural Business and Compassion Conference at Stanford University, School of Medicine. It was hosted by CCARE, the Center for Compassion and Altruism Research and Education and facilitated by Dr. James Doty, Director and Founder of CCARE and Clinical Professor of Neurosurgery, and his team. I was so excited to be in the same space with professionals who are working with the same hope and inspiration that drives Uplift. We all have something to contribute in a world of peace, kindness, and compassion…and, business has an important role to play. The room felt grounded and energized. It was a space that created room for authentic camaraderie, a place to be yourself with zero room for ego or ‘what’s in it for me’ or any form of competitiveness. The energy throughout the conference was united and geared toward working together. There were nothing but welcoming smiles filled with joy, gratitude, and sense of purpose. As you can imagine, this is still a rare experience (unless it’s a yoga class or retreat), especially in the business world. For me, this conference fired up a passion to get out there and do more. Imagine if we could create workplaces like this? The good news is we can! Uplift is here to help you and your organization create team unity, passion and compassion in the workplace, and a greater sense of purpose throughout. At Uplift, we help individuals and organizations fuel mindful positive growth by integrating yoga, meditation, and mindfulness into life and workplace practices. The tools we share fuel great clarity, innovation, peace, kindness, compassion, self-awareness, self-management, and deeper wisdom. Moreover, it works. Similar programs have boosted employee engagement and organizational well-being while improving bottom line. Do compassionate practices in the workplace payoff financially? Every one of the presenters at the conference gave a resounding, “yes!”. Emma Seppala, Associate Director at CCARE, talks about this new field of research, “which suggests that when organizations promote an ethic of compassion rather than a culture of stress, they may not only see a happier workplace but also an improved bottom line”. It’s a different way of working and one that is being welcomed in all industries. The research shows that instilling a culture of compassion is not only the right thing to do, but it’s good for business. The most influential world leaders are driven by compassion: Mother Theresa, His Holiness the 14th Dalai Lama, Mahatma Gandhi, and Nelson Mandala, to name a few. The common theme throughout the conference was the promotion of self-awareness as a means to greater change. You see, outer compassion begins with inner compassion. So why aren’t more leaders, organizations, and individuals catching on? Chip Conley said it well, “the most neglected fact in business is that we’re all human”. We need a different approach to business. Everyone I speak to wants it or they’re getting prepared to leave companies to find it. What is being suggested is new. We’re pioneers of this movement. But it’s a different approach and like anything new, it takes time. People, for the most part, don’t like change and let’s face it, we’re not talking simple, straightforward change but transformational change. The Business and Compassion Conference assured me that though we need to move forward with a sense of urgency, we’re supported in creating the steps necessary to make it happen. I need you to believe this and I hope that you will reach out and invite us to support you along the way. We can create a business world that supports and rejuvenates us all by collaborating to making this world a better place for all. As I settle into the week, I will be continuing with the New Business Paradigm Series, supporting Uplift clients, getting prepared to speak at a business event, working to support acts of kindness and compassion, and sharing more wisdom along the way. I hope you will stay tuned. Looking forward to collaborating and supporting you on your path. With much kindness and compassion.